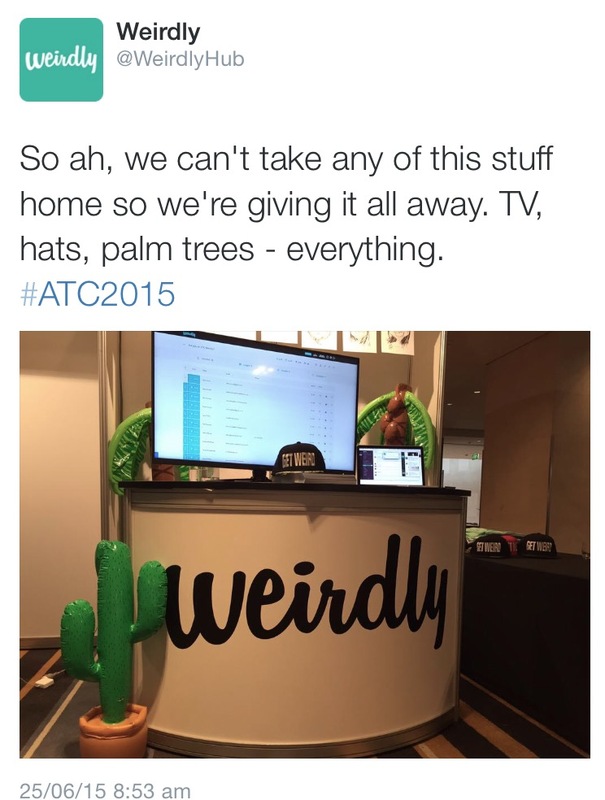 This week we’ve been over the ditch at one of Australasia’s biggest recruitment and HR conferences. We were there for all the usual reasons – listening to some brilliant speakers, schmoozing, panic-eating the insane mini cheescakes. But this year we were also exhibiting with our own shiny trade booth where we could live-demo the Weirdly software and let prospective clients have a play. Get a really good position – I can not emphasise this enough. We had the stand right next to the entrance to the main conference hall, the food and the “milling around” zone. It gave us a HUGE advantage over the poor guys at the back of the exhibition hall who were really fighting to get anyone to visit their booths. It also meant we were subconciously exposing people to our branding all day long, inching our logo into people’s RAS and making all our other marketing and sales activity more powerful. You don’t need to spend big to get noticed – We knew some people would be spending upwards of 20K on their booths. Our budget didn’t quite reach 2K. So we had to be smarter. Keeping in perspective what you’re trying to achieve is important: We needed to look lively and interesting. Hiring plants and furniture was pretty exhorbitant so instead we bought a few blow-up palm trees and a cactus and created that liveliness by totally owning the fun, slightly-strange feeling of our brand. We needed a big screen to run demos and show off our dashboard. Hiring a TV for two days cost just over $800. Buying one cost around $400 and then we had something awesome to give away as a prize on the last day. Win/win/bonus/win. We needed something that would engage people and draw them to our stand. A fun product demo. The best thing we did was creating a fun, conference-specific Weirdly quiz that people could do on their phones over the three days. We tweeted this out, and actually got people to do it live during our talk. This was particularly awesome because it got people interacting with and learning about our product, and meant they all wanted to visit our stand to find out how they’d scored. It also meant we got names and contact details from heaps of people, straight off the bat. Awesome merch. We made t-shirts and hats that people actually wanted to wear, then we made it kinda hard for people to win them. This was magic because it meant people went away talking about them. They also kept coming back to learn more about us and think about how they would convice their bosses to sign up to our product so they could get one. When we finally gave them all away on the final afternoon, the people who got one were extra keen to find a way to integrate Weirdly into their business. An interactive gimmick. 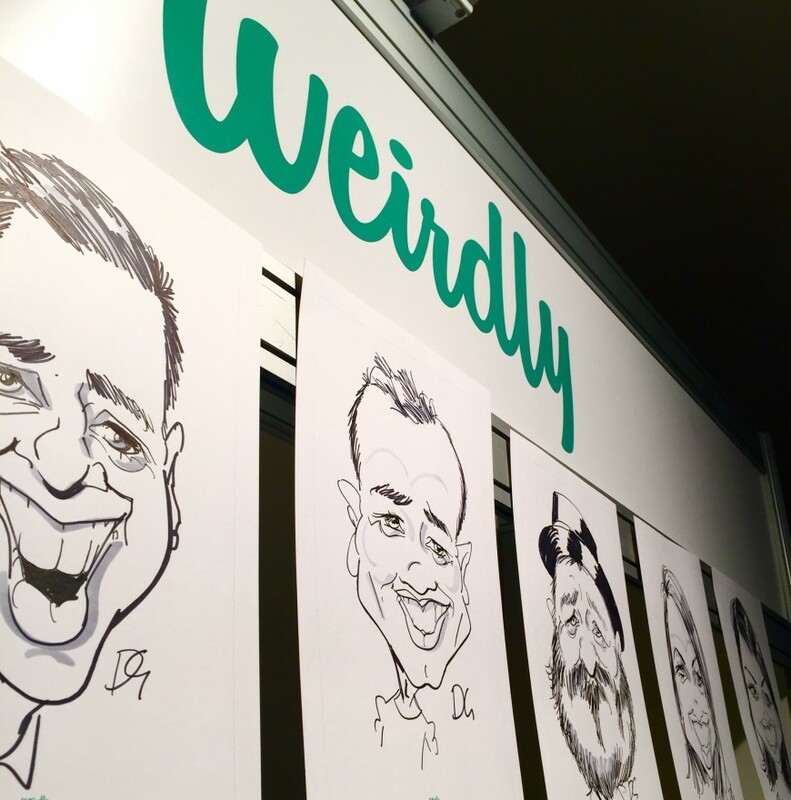 We got an artist to sit at our booth and draw caricatures of anyone who wanted one (read: everyone at the conference). To top it off, we had heavy card flyers printed with info about Weirdly on one side and a blank page with a subtle Weirdly logo at the bottom. Our artist drew on the blank side of these so people when people stuck them up at their desk or on their fridge at home, we were right there too. A strong finish – we gave away everything. To make a big, memorable impression and collect more names and contact details we announced we were giving away everything from our stand. Everything. News spread like wildfire. People came to the stand to write the item they wanted on their business card, and throw it in a bowl. We announced winners on Twitter and generated that last memorable bit of buzz. Best yet we got lots of extra booth visitors who wanted to learn more about us. Laugh and smile a lot. It’s not rocket science. If you don’t look energetic, friendly and fun no-one will want to talk to you. There was a particular booth at this conference (that will remain nameless) with had a grumpy-looking lady doing work on her phone the whole time. Her booth was beautiful, but she didn’t get many visitors. Get interactive with your demo. We know people love Weirdly once they use it. That’s why our entire focus was to get as many people playing with the product as possible, especially in ways that highlighted our key selling points. Alongside our conference-specific quiz (which let them see it from a candidate’s perspective), we let people click around in the client dashboard. This reinforced how easy it was to use. Sort the technology properly beforehand. We needed people to play with the software, but internet connection was a big challenge here. Conference wifi is almost always a bit crap, so we requested an ethernet cable to keep our load speed feeling good. Still, we spent a huge proportion of the time with our phones tethered so the bills aren’t going to be pretty. Next time, we’ll definitely investigate back-up connection options. Even if it’s just buying a super-boosted phone data plan in advance. Get friendly with your neighbours. There were periods where most conference delegates were in the main hall listening to speakers. Rather than spending this time answering emails or writing blog posts (which to be fair, we really NEEDED to do sometimes), we made sure we took time to get to know the people manning the booths near us. Aside from discovering some cool products, we also ended up signing a few onto subsciptions and scheduling a few follow-on discussions about possible integrations. We also found that these chats turned people into advocates. They spread the word about our competitions and caricatures. And even better, told conference delegates about how cool we are and how well we could work with their own product. They were like some kind of sales opportunity/referral marketing hybrid. Never go it alone. We were only going to send one person over for this and man, are we glad we didn’t. Manning an exhibition booth while also conducting sales meetings and demos is exhausting. Also, your busy rushes are BUSY. For us, this was lunchtime and breaks. One person simply wouldn’t have been able to service the demos and questions by themselves. The key though is make sure you pick someone you can happily spend 12-15 hours a day with. And if it’s at all possible, get two rooms. You’ll need a break, even if you’re good mates. We found awesome deals on last minute websites (and serviced apartments were heaps cheaper than two hotel rooms). Eat well. Drink lots of water. After our first day, we were so tired we just grabbed whatever we could find from the local corner shop for dinner. Basically, instant noodles and chocolate bars. TERRIBLE MOVE. Don’t do that. We were double-tired the next day as our bodies tried to battle sleep deprivation, jet-lag and poor nutriton. Here’s what you need to consider. You are running a marathon. You will not stop talking for 12 hours. Your energy needs to be high the whole time. Your feet will not get a rest. You’ll be snatching whatever food is left on the buffet after you’ve spent the lunch break running demos with conference delegates. If you want to keep your voice and stay sharp till the end of the exhibition, make sure you’re hydrated and looking after yourself. Also, going out on a bender can be good for networking, but it means you’re basically useless the next day. So, yeah. Take it easy on the booze. Fly in the night before. We definitely did this wrong. We arrived on the day we were presenting thinking we’d pack it full of sales meetings before the conference kicked off that evening. This meant a 16hr day of sales meetings, culminating in our speaking spot. It was a terrible idea. Arrive the night before and make sure you kick off the big event nice and fresh. Bring everything with you. We had some stuff (masking tape, every possible Mac connector, dongle and cord we could possibly need) but we still had to borrow a stanley knife and a screwdriver from a friendly tradie. Treat this like you’re going on a day trip with a two-year old: pack everything. Then also pack a spare change of clothes. You never know what could hit (you just know it’ll probably involve you needing new pants and some double-sided tape). Wear comfortable shoes. Ever tried to stand in high heels for 12 hours straight? It’s not so great. Also, chances are you’ll be running a TV up and down three flights of stairs at some point so make sure you’re wearing shoes you can feel comfy in. Even though it costs a lot of time and energy, exhibiting was really worth it for us and we’ll definitely be doing it again. There’s nothing quite like talking face to face with people and letting them experience your product first-hand. As a SaaS business, this also throws up really useful insight into how real people (ie. not-techy people) are using your software. So all in all, exhibiting = awesome, eating only noodles for dinner = not awesome. Hey! Great ideas. I’m planning on doing a conference later this year and will definitely take this on board. How much was the big stand thingy with your logo on it?? Hey Kim, We actually hired the stand itself from the event company – it was around a hundred dollars ($AUS) from memory. Then we got a $40 vinyl cut made of our logo and applied it on the day. Not the easiest thing to stick on straight (don’t look too hard at the photos!) but it was really effective and the vinyl was easy to transport over on the plane! My tip if you’re doing it this way is to allow yourself a full 40mins or so for the application. It took FOREVER to smooth out the air bubbles before pulling off the backing paper – it’s easy to do with the back of a credit card, it just takes ages.